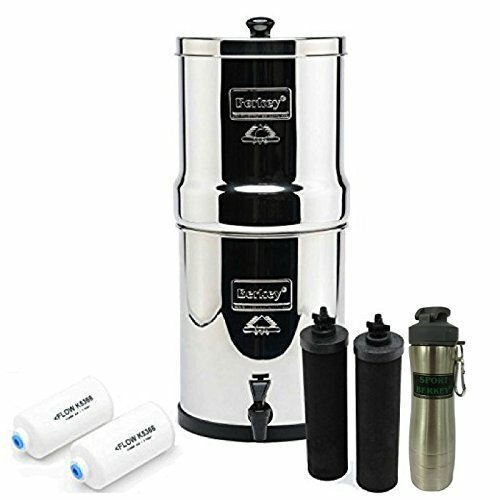 Berkey BK4X2-BB Big Berkey Water Purifier is the excellent system for usage at home with small or moderate-sized households, travel, exterior tasks or throughout unanticipated emergency situations. This effective system cleanses both cured water and unattended raw water from such resources as remote lakes, streams, stagnant ponds as well as water products in international nations, where regulations could be substandard at better. Perfect for everyday usage, outside tasks and a should in hostile environments where electrical energy, water pressure or treated water could not be available. The Big Berkey system gets rid of pathogenic germs, cysts and bloodsuckers completely as well as extracts dangerous chemicals such as herbicides, chemicals, VOCs, organic solvents, radon 222 and also trihalomethanes. It also lowers nitrates, nitrites and also harmful minerals such as lead and mercury. The Berkey water filter system is so effective it can remove food coloring from water without getting rid of the valuable minerals your body requirements. Practically no other system can duplicate this efficiency. Constructed of highly sleek 304 stainless-steel, the system comes complete with four filtration aspects and also uses the most up to date technological advances. The Big Berkey has a storage capacity of about 2.25 gallons (8.5 liters) when being used it stands 19.25″ in height with a size of 8.5″. The upper chamber nests within the lower chamber for transportation as well as stands only 13″ in elevation. It is nice to see a product with such wide acceptance from its customers. The fact that 88% of reviewers gave the Berkey Big Boy 4 or 5 stars is impressive. Other water systems still in our reviewing process do not rank as well. Indeed, BeHealhyBeMore.com will not review one major water purification system manufacture due to the high amount of negative reviews. The claim of water purification from all water sources is impressive. Many filtration systems are based on tap water, which is fine for people living in cities, but if you are not part of a municipal water system, then this level of filtration would be a significant consideration. No independent certification of filtering levels. The best “proof” we have for that is some private testing for just a few specific issues. So, much of this it on the word without independent certification. It is only fair to mention that most water filtering systems do not come with independent certification. The lack of a flow meter is a tad concerning. There is a filter life stated, but no real and practical way of knowing when that limit is reached. At best the machine is “inconvenient” to use. With the cleaning and the special care needed for unused filters. However, that may not be a game changer for many. Berkey’s loyal users do not seem to mind at all. The Berkey system is definitely a contender in the water filtering purification market. This product will be chosen to move into comparison with another deserving filter purification product. This unit can not be ignored when considering a water purification system for rural, non-municipal water source. So for that need, we rate the system 5 out of 5 Stars. When you live in a town or city with a municipal water system, then we rate The Berkey Big Boy a 4 out of 5 stars. Why? Once we can assume disinfected water to eliminate the biologic concern, other systems rate better.